St. Monica is a very powerful intercessor for all those to go to her for help. She was the mother of St. Augustine who is a Doctor of the Church and a highly revered Saint, philosopher and theologian. 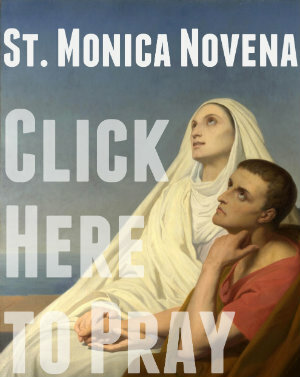 St. Monica prayed for her wayward son and pagan husband fervently throughout her life. After 17 years of prayer, St. Augustine converted and eventually became the great Saint we know him as today. With your needs, worries and anxieties, you threw yourself on the mercy and providence of God. Through sorrow and pain, you constantly devoted yourself to God. Pray for me, that I might join you in such a deep faith in God’s goodness and mercy. Above all, dear Saint Monica, pray for me, that I may, like your son, turn from my sin and become a great saint for the glory of God.